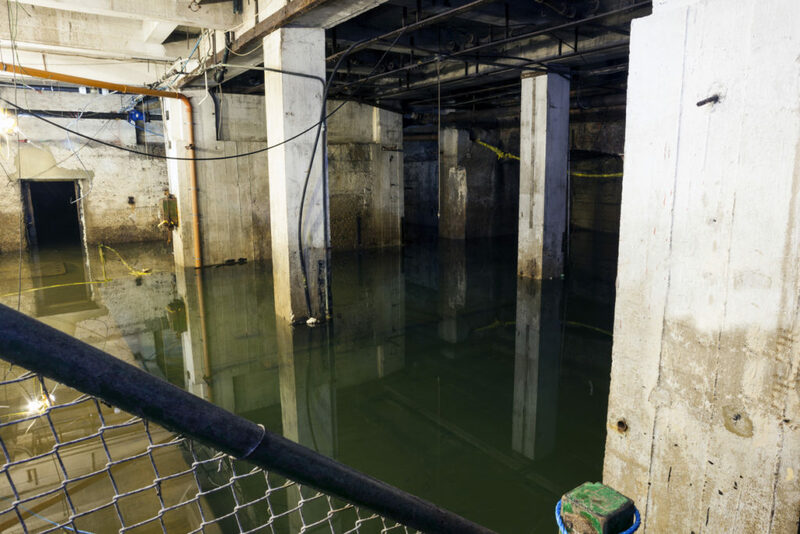 There are many causes of flooded basements in commercial properties, and although some floods are due to poor property maintenance, a basement can also flood because of poor construction. One of the most common causes of basement flooding is a result of leaks in the tie rod holes in the basement walls. In order to prevent these leaks from causing potentially serious flooding in your basement, it’s important to know how they cause leaks. Here is everything you need to know about tie rod hole leaks so you aren’t faced with a messy flooded basement clean-up on your commercial property. What Is a Tie Rod Hole and How Do They Cause Leaks? Tie rod holes in basement walls are created by the 5/8” rods used to hold the steel forms together during the original foundation pouring of your basement. After the concrete has cured, the rods are disassembled and when they are removed, holes are left that go straight through your foundation. These tie rod holes in the concrete are usually filled on either side with a ball of hydraulic cement, but there are cavities left in the middle of the foundations that can pose a risk for leaks. If this procedure is not done correctly, this small block of cement can break down over time and allow water to run into commercial property. Since water takes the path of least resistance, it will always flow through the tie rod holes if there are gaps. This is why the problem is so common—if water can find its way in, it will definitely end up in your basement. How do you know if your tie rod holes are prone to leaks and flooding? Look for a small stain the size of a coin on either side of your basement walls. Another sign can also be a water line that leaks down to the floor. Severe leaks can cause water to pool below, and in worse cases, cause flooding. If your tie rod holes are leaking, you have time to resolve the issue. But it should be handled by professionals who can make sure they don’t leak again. However, you may be faced with a situation where the damage has already been done, and now your basement is flooded from leaking tie rod holes. Worry not—there is a professional team of experts who can understand the situation, find you a solution, recover as many valuables as possible, and keep your commercial property in the best shape. Flood Services Canada has quick-response teams that can arrive quickly to the problem site and begin drying your home and recovering any damaged belongings with precision and professionalism. We have helped homes and businesses across the GTA and will use the best techniques, personnel, and technology to ensure your home is clean, safe, and dry as quickly as possible. To reach our emergency hotline, call us at (416) 999-3930. Our main office can also provide you with more information on water damage services and useful tips for different types of clean-up scenarios.